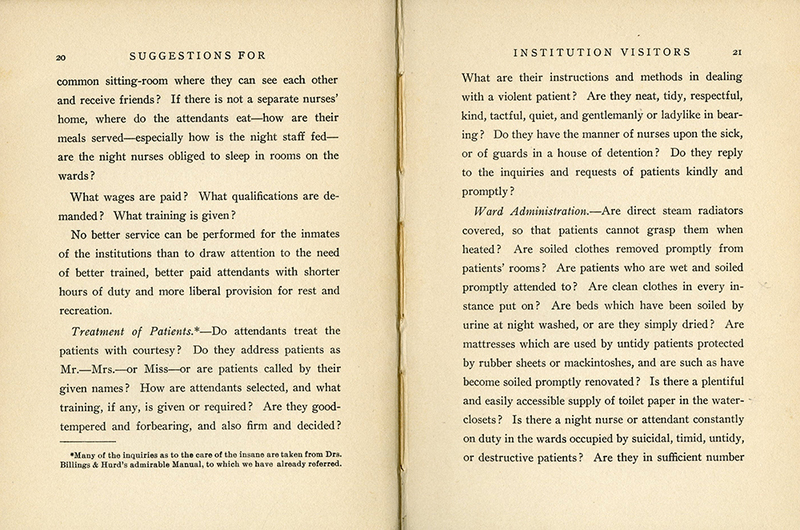 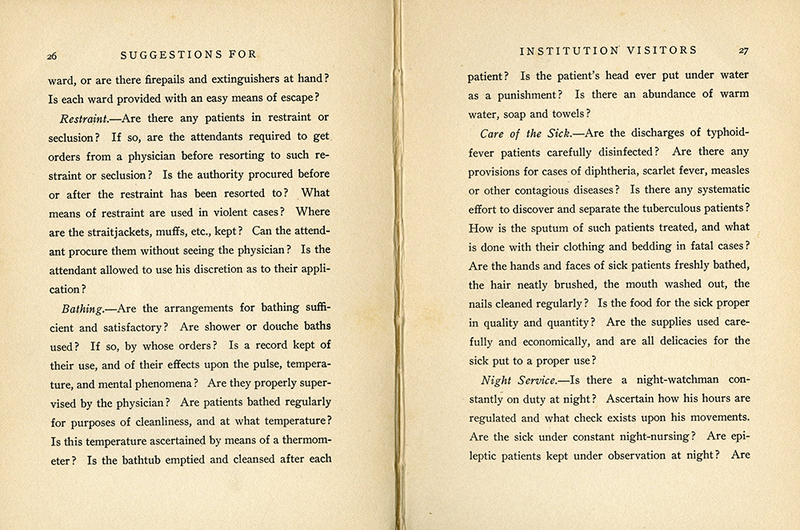 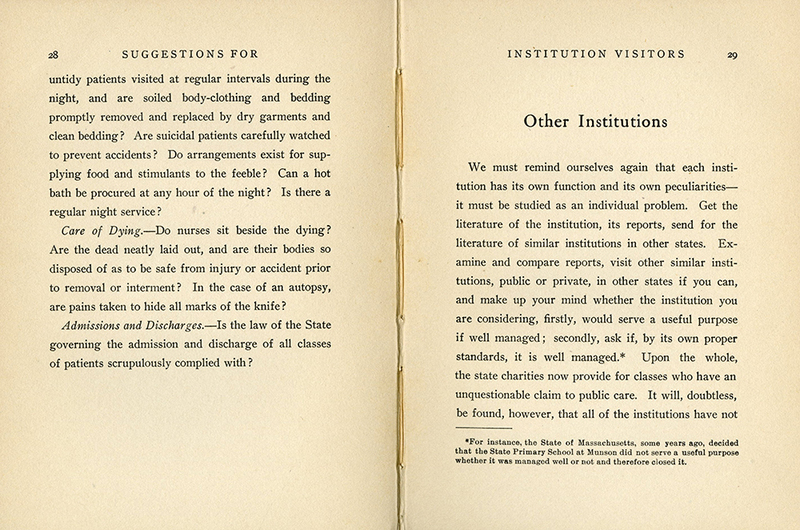 Cover title: Suggestions for Institution Visitors. 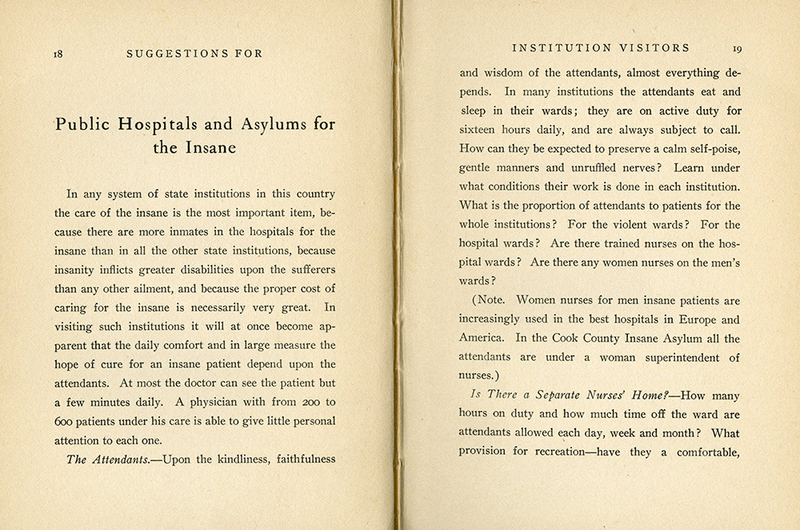 A small volume that offers guidelines or suggestions for those undertake the investigaton of county poorhouses, public hospitals, asylums for the insane, children's homes, and industrial schools (homes for wayward girls and boys). 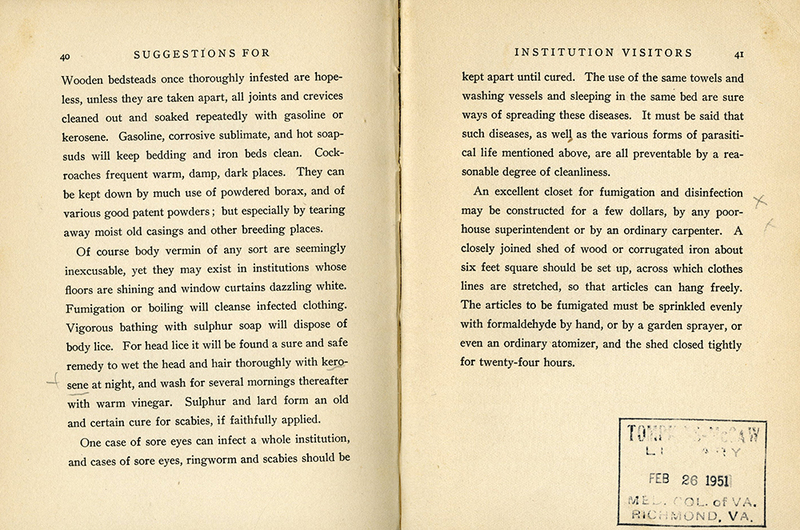 A chapter titled "Homely Hints" supplies remedies for typical institutional problems such as bedbugs, roaches, vermin, ringworm, scabes, and sore eyes. 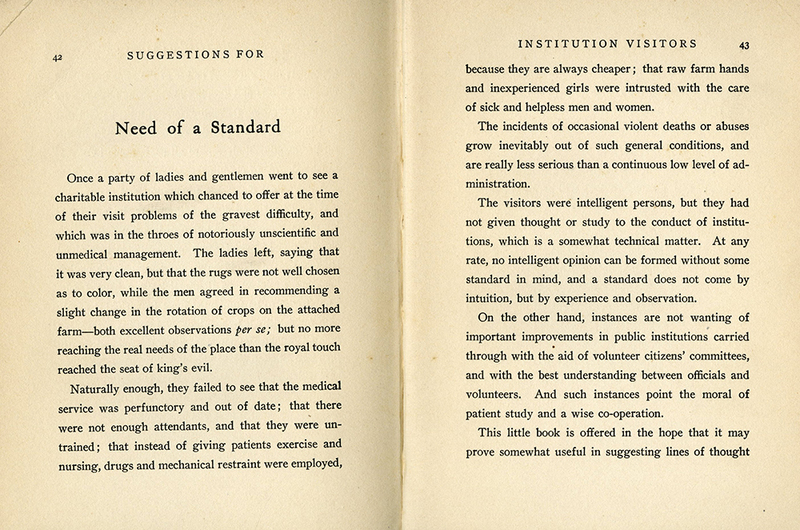 The final chapter addresses the need for standards by which such institutions may be evaluated. 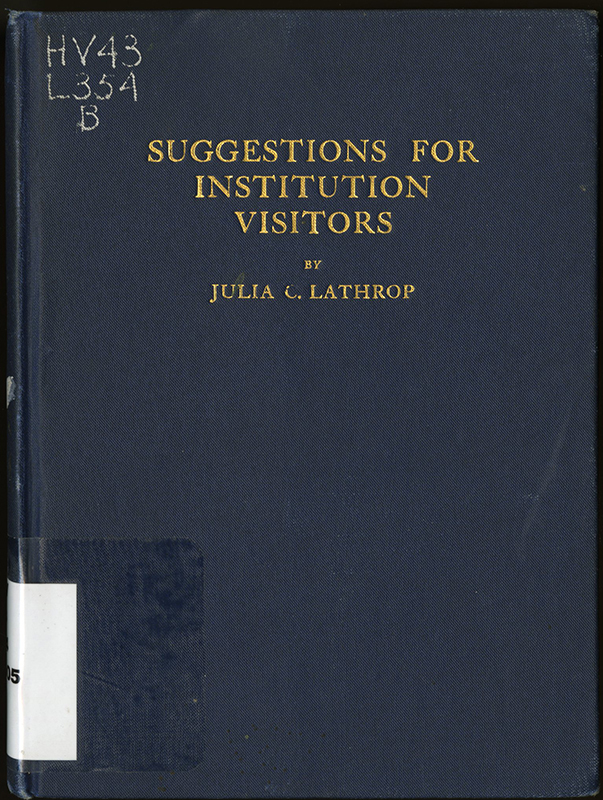 Throughout, Lathrop encourages the visitor/inspector to keep an open mind while being friendly, knowledgeable, confident and persistent. 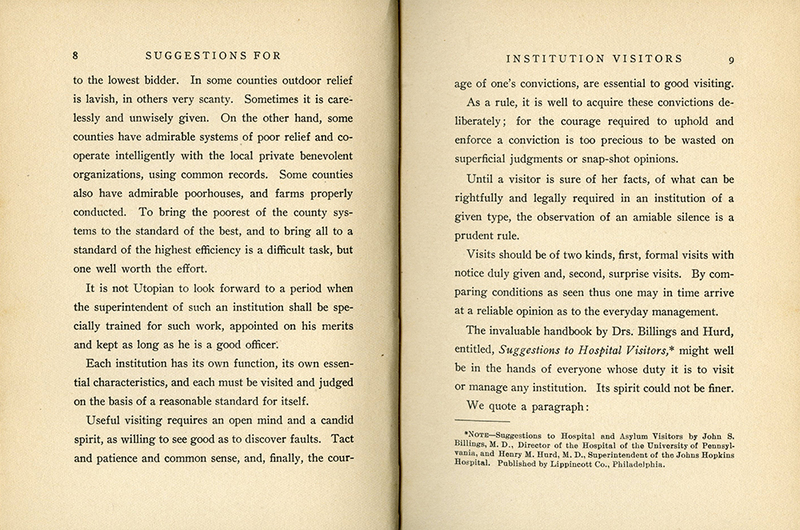 This advice was very much in keeping with Lathrop's own methods. 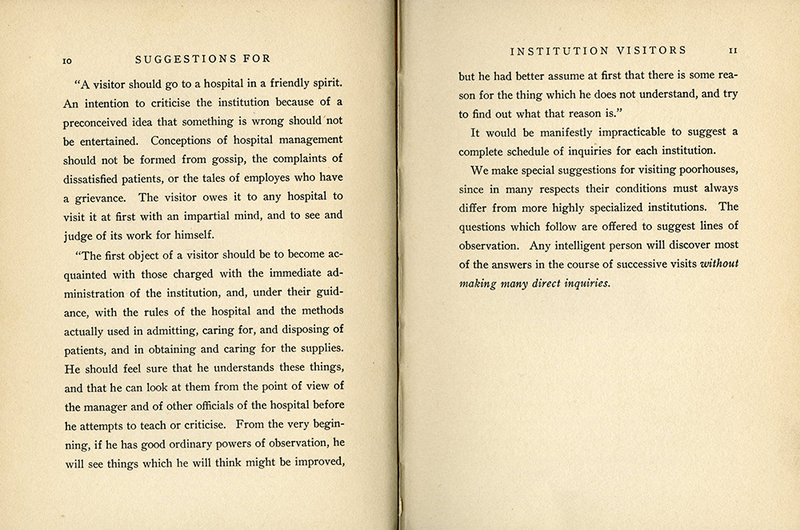 p. 6 "If you meet superintendents in a candid and friendly spirit, they will probably meet you in the same spirit. 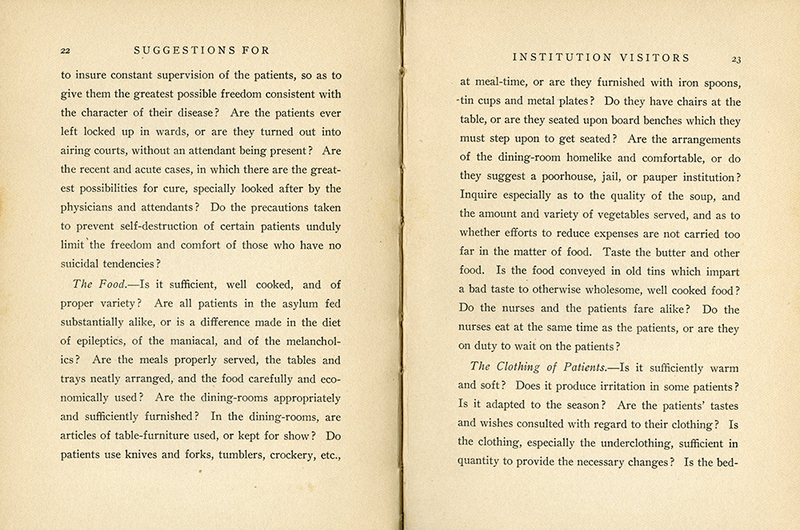 They usually want to do their duty and they doubtless have many difficulties you do not see. 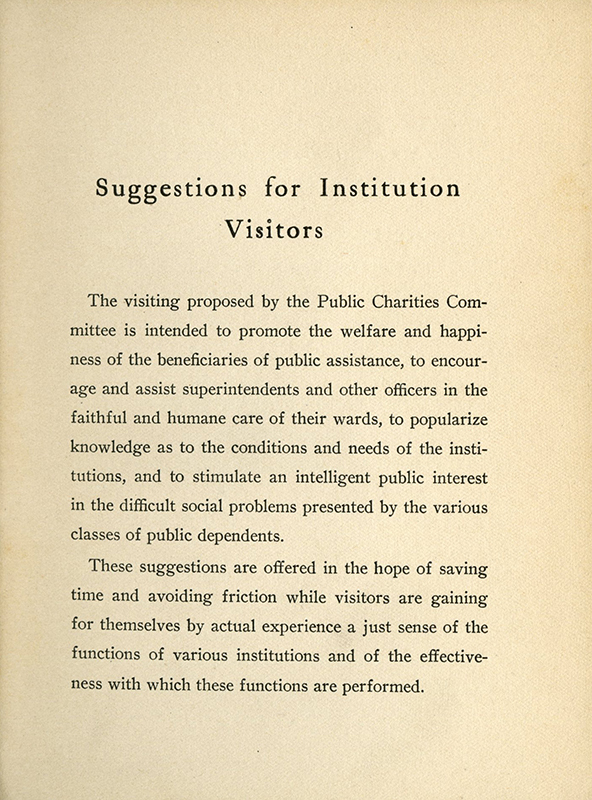 Like the rest of the world, they will probably welcome the visits of intelligent, good-natured, reasonable persons who want to know them and who through various avenues of influence may be able to help them. 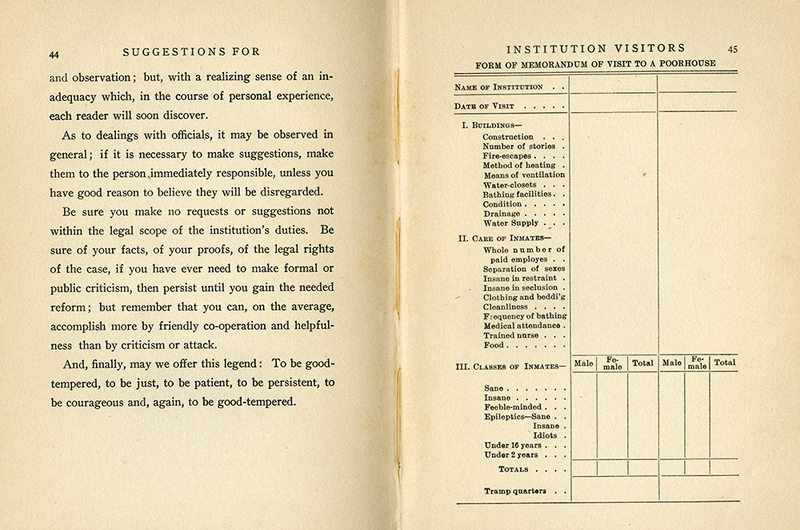 Try to understand, then, first of all, the official point of view and the official difficulties. 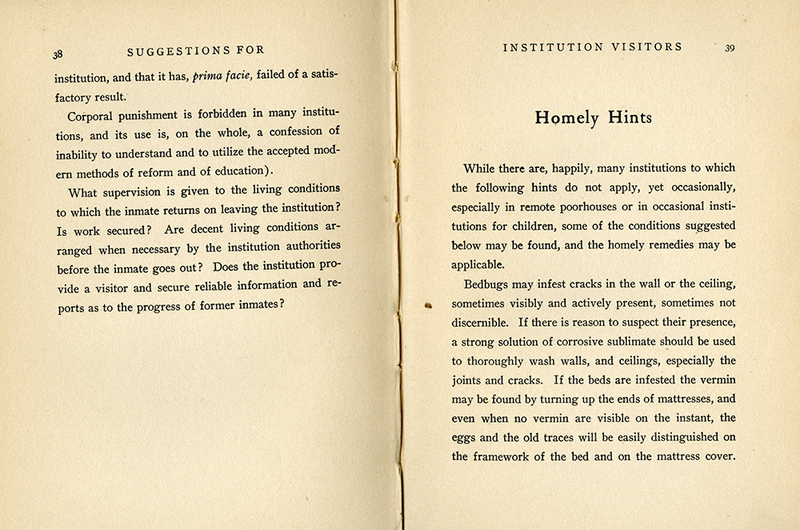 A critical, suspicious bearing will defeat your purpose to learn the facts." 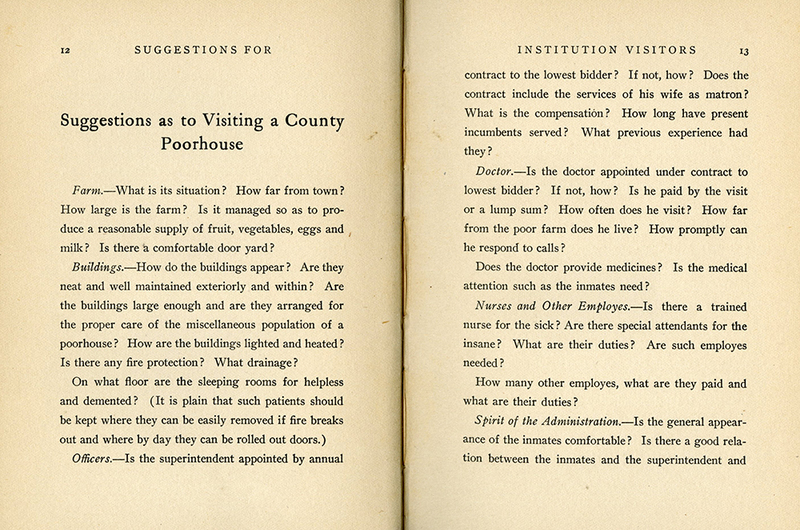 p. 7-8 "In many counties the superintendency of the county poorhouse and farm is let annually to the lowest cash bidder. 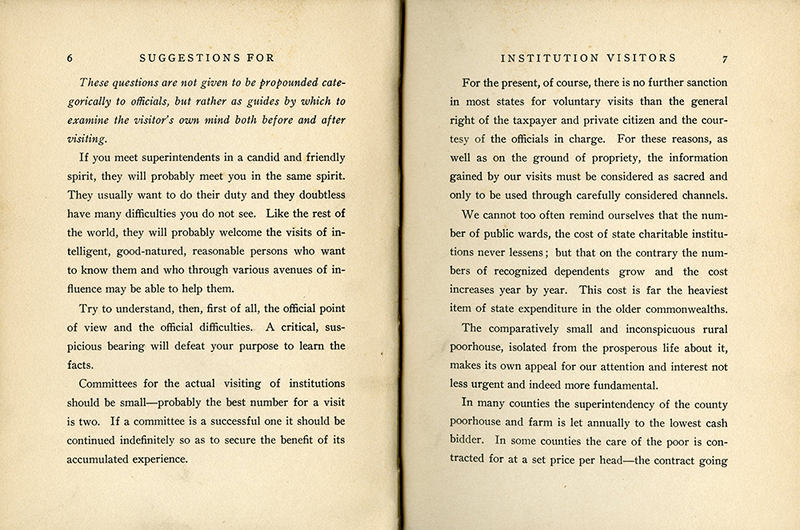 In some counties the care of the poor is contracted for at a set price per head--the contract going to the lowest bidder....It is not Utopian to look forward to a period when the superintendent of such an institution shall be specially trained for such work, appointed on his merits and kept as long as he is a good officer." 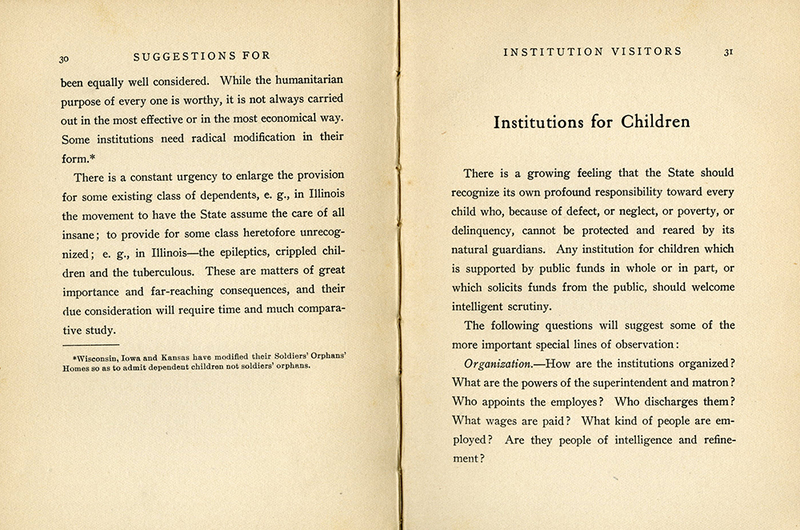 p.31 "There is a growing feeling that the State should recognize its own profound responsibility toward every child who, because of defect, or neglect, or poverty, or delinquency, cannot be protected and reared by its natural guardians. 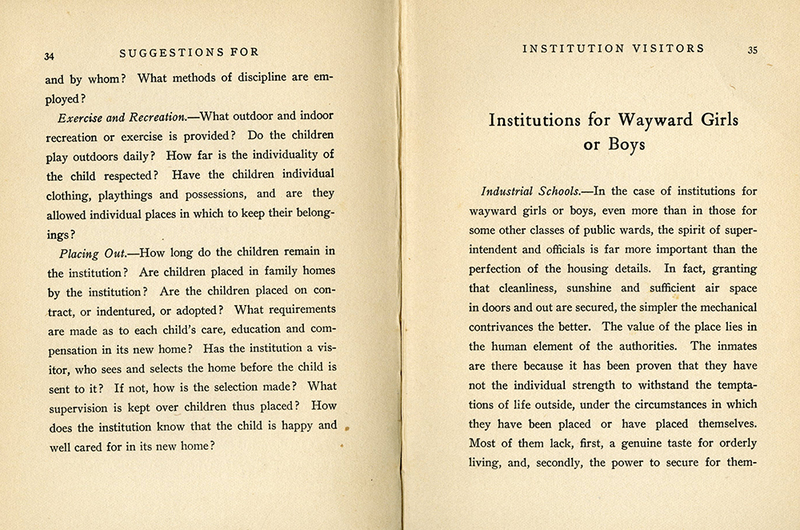 Any institution for children which is supported by public funds in whole or in part, or which solicits funds from the public, should welcome intelligent scrutiny." 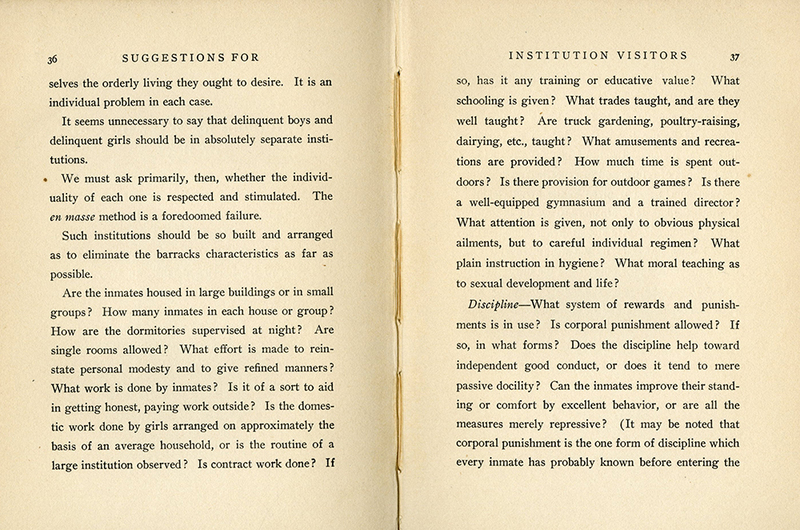 p.37-38 "It may be noted that corporal punishment is the one form of discipline which every inmate has probably known before entering the institution, and that it has, prima facie, failed of a satisfactory result." 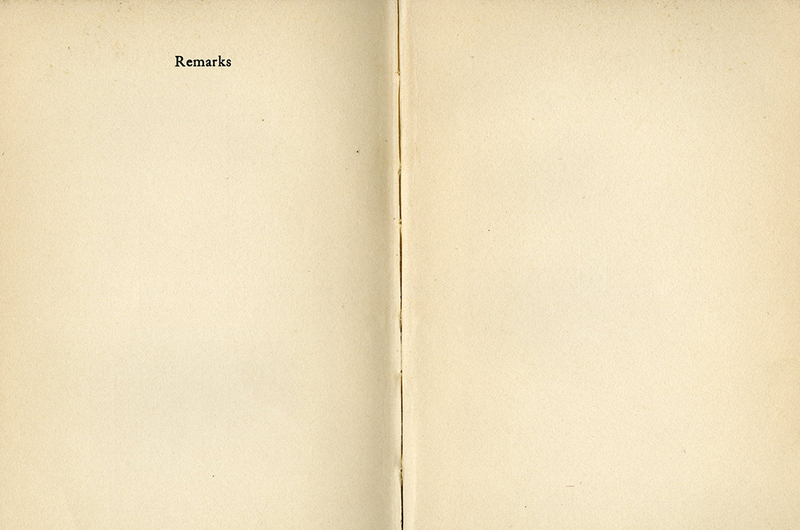 p. 44 "And, finally, may we offer this legend: To be good-tempered, to be just, to be patient, to be persistent, to be courageous and, again, to be good-tempered." 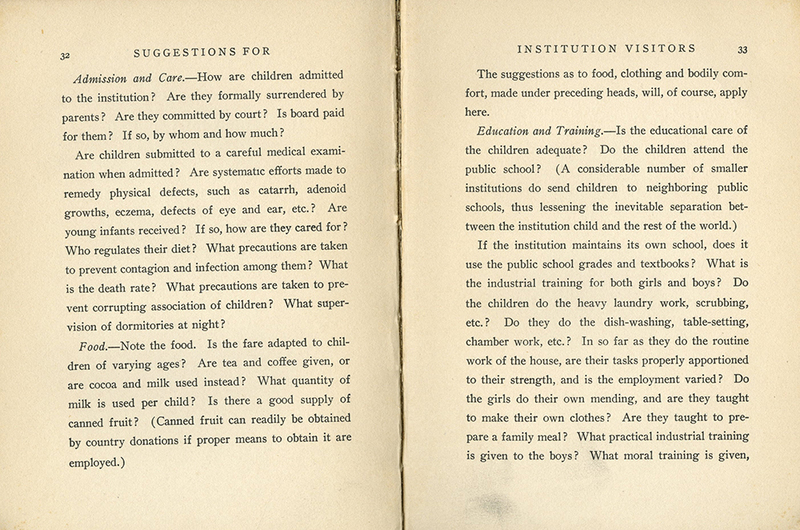 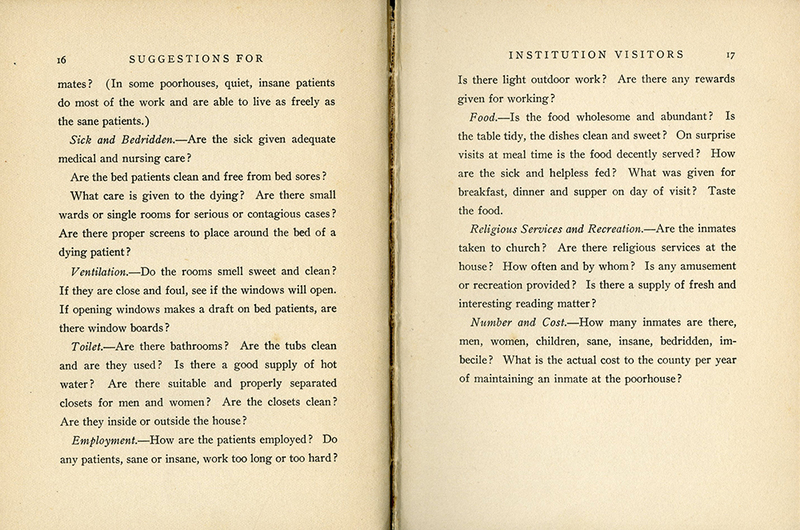 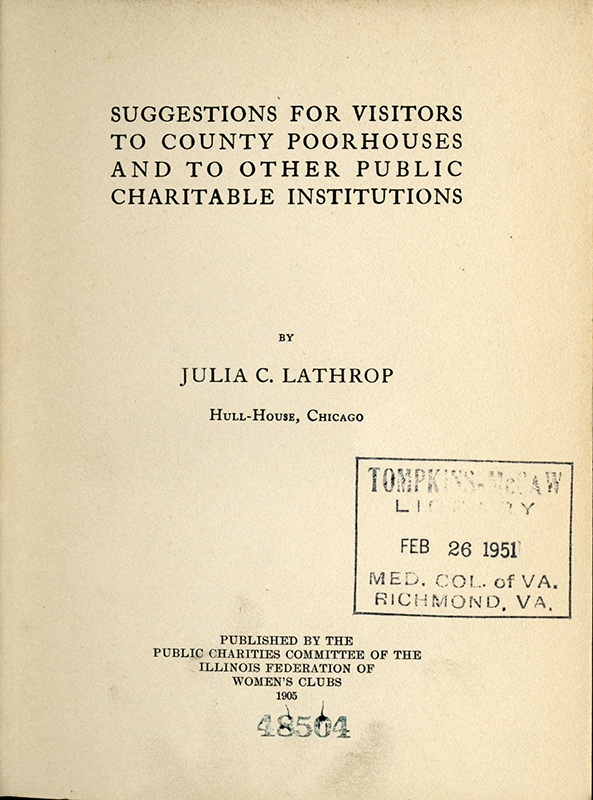 Lathrop, Julia C., “Suggestions for Visitors to County Poorhouses and to Other Public Charitable Institutions,” Social Welfare History Image Portal, accessed April 26, 2019, https://images.socialwelfare.library.vcu.edu/items/show/298.